What is it with people and mountains? According to Friedrich Nietzsche, ‘he who climbs upon the highest mountains laughs at all tragedies, whether real or imagined’. Fair enough. But is this really a rationale, or just a sign of high-altitude deliria? When asked why he wanted to climb Everest, George Mallory famously replied: ‘Because it’s there.’ Unfortunately for Mallory, so too would his corpse soon be. (Nietzsche, a keen mountaineer himself, would have probably found this hilarious.) ‘Apparently, more people have died climbing Kilimanjaro than Everest’, I tell my mother as she bids us (her husband and three children) farewell at the airport. This trip should be a laugh-fest. In truth, the death rate on Kilimanjaro pales in comparison to the sheer number of climbers who set out to scale the mountain each year (some 25,000 in 2010). 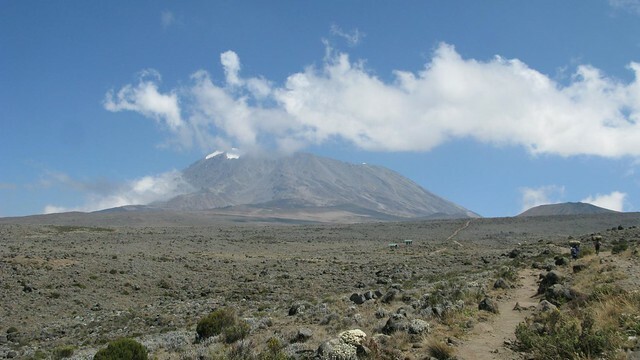 As big mountains go, ‘Kili’ is pretty user-friendly; there are several well-trodden routes, a host of trekking companies and comfortable campsites with hot running water and tea- and coffee-making facilities. And yet, at the best part of 6,000m, Africa’s highest peak is not to be laughed at (though Nietzsche probably would…). Though the climbing is non-technical - unless of course you’re one of porters (standard issue: two per person) balancing a week’s worth of food and fuel on your head – the success rate on the main routes is low, as little as 30% on the most popular approach. The cause is rarely physical exertion – the porters shoulder that burden - but rather the Russian roulette of altitude sickness, the symptoms of which are often described as being akin to the worst hangover imaginable. A sobering thought. I’m fairly apprehensive, then, about my family’s chances of reaching Uhuru Peak. Though all of our party are in fairly good shape, that 30% success rate means that, statistically speaking, only one of us (or one and a bit – queue chortles from Nietzsche) will make it to the summit. “It’s the journey that’s important, not the destination”, we remind ourselves (30% in jest, 70% in justification). And quite some journey it is. All the pre-trek chat about altitude sickness, sub-zero temperatures and blisters the size of sheep’s bladders had obscured the fact that this was, after all, a five-day hike through a spectacular national park. The mountain itself is a sky island, its various ecosystems having been severed from the mainland and cast adrift in a sea of cloud. Indeed, as one of the world’s tallest ‘true’ mountains, Kilimanjaro comprises five distinct ecological zones, each home to countless endemic and relict species of flora and fauna. So immense is this upturned ark that the migratory birds inhabiting its lower levels need only move a few kilometres up the mountain come change of season. Conversely, a creature at home on one part of the mountain may struggle to survive just a short distance up (as many a climber has discovered). Day three is an alpine desert, literally and mentally. Features on the trail, targeted as milestones, appear, like the charging knights in that Monty Python scene, perennially out of reach, while further still the mile-proud peak taunts us with its indifference. By the time one reaches Kibo Hut (4,730m), the prospect of tomorrow’s climb seems about as appetising as the cucumber soup we’re served at dinner, not least because tomorrow’s climb starts in just six hours, at 12 a.m. sharp. Between then and now, one is required to negotiate a string of ultra-banal tasks – eating, resting, visiting the little boy’s hut – which, on account of a lack of oxygen and an overabundance of underwear, are rendered epic undertakings in themselves. Thus, it is with a curious mix of abject fatigue and raw adrenalin that we set off through the midnight dark to begin our summit attempt. As the sun prizes open the firmament, we are greeted with a sight of untold majesty: ok, it’s still the back of our guide’s boots, but now the boots in question are rounding the crater rim, with ice fields to one side and the parched mouth of the volcano to the other. Shadows shorten, and in no time at all (well, another mind-numbing hour) we’re standing on the rooftop of Africa, surveying the continent, laughing at tragedies, queuing for a photo with the sign. And no sooner has the shutter clicked than we’re off again – this is no place for loitering – surfing down the mountain on a tide of scree. This is pretty much the story for the next two days. Our route down is the same as the one we took up, which means no new scenery but lots of fun to be had with those en route to the top. (The words ‘good luck’, we discover, uttered with a knowing smile, can fill people with both bonhomie and utter foreboding.) Gradually, life returns to the mountain, and with it civilisation. At this point, our interest in the latter extends no further than showers, beer and Internet, which we seek out (in this order) once back on flat land. A week later, the clouds clear momentarily and the mountain graces us with a view from the plateau. A curious feeling consumes us, one probably common to all ‘real’ mountaineers; it’s nothing more profound than ‘I was there’, and strangely, there’s nothing more exhilarating. In the spirit of broadcasting standards, I should point out that other Kili trekking routes are available. While Marangu is doubtless an option if time and money are very limited, we always prefer to recommend one of the longer routes (Machame, say, or Lemosho), which promise a far greater chance of reaching the summit. Moreover, unlike the Marangu, these other treks don’t jag back on themselves, which means a greater variety of scenery and far fewer mid-mountain traffic jams. 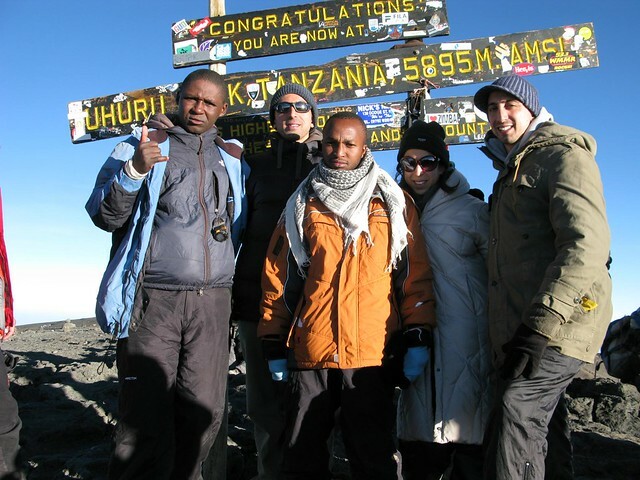 This post was written by travel writer David Jobanputra, who climbed Kilimanjaro in Summer 2011. Find out more about David here. Please note, we no longer offer treks on the Marangu route as we don't believe it offers sufficient acclimatisation when compared to some of the other superior routes on the Mountain.